The crowd watching sample video at Tuesday's meeting. The Albany Police Department has a plan to start deploying body cameras to all its officers this July. The details of the rollout of the cameras -- and how they'll be used -- were the main topic of a presentation by acting police chief Bob Sears at an Albany Community Policing Advisory Committee forum at the Albany Public Library Washington Branch Tuesday evening. Sears also took a bunch of questions from the crowd in discussing the department's policy for the tech. 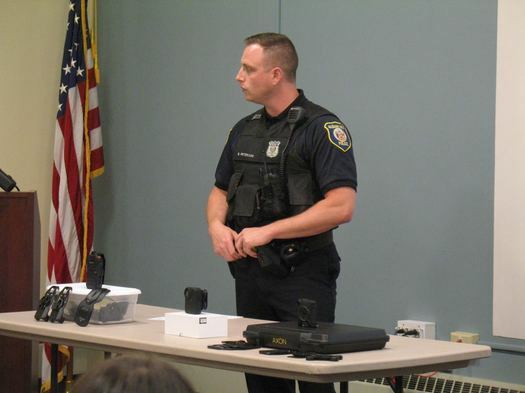 The Albany Police Department has been working on adding officer-worn body cameras since at least 2015, when the federal government awarded the department a $133,000 grant to acquire the tech. APD held a couple of meetings in 2016 to discuss its progress on putting together a policy for how they cameras will be used. And the department started pilot test of cameras from four different vendors last October. 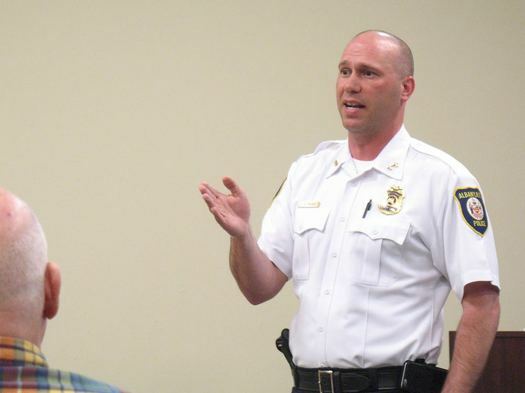 At Tuesdays meeting, acting police chief Bob Sears explained that two teams -- each composed of nine officers and one sergeant -- have been testing the cameras during their regular patrol duties since then, and the department has been collecting feedback. He said the department is hoping to select a vendor in the next few weeks. A few of the cameras were on display at the meeting. And an APD officer -- Ben Peterson -- was there to demonstrate how they're used. They're pretty much what they sound like: a camera that clips onto an officer's torso -- usually around chest height -- and starts recording video and audio when the the officer presses a button. As Peterson explained, each vendor's camera has some different features -- one of the models has a screen on it, another allows officers to watch video via smartphone app, another ties into the lapel microphones that officers wear for their radios. Sears said all of the cameras have a function that continuously records 30 seconds of video prior to the record button being activated. The APD will be sending the recorded video to "cloud" storage system. Sears said that storing the video locally wasn't feasibly because of cost and technical constraints. One of the cameras the APD is considering. Who will be required to wear them? 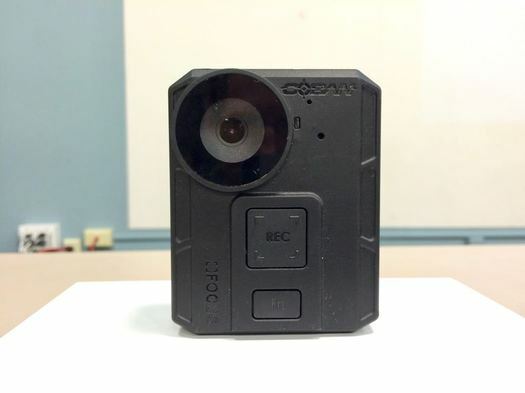 All officers working patrol shifts, traffic safety, or in the Neighborhood Engagement Unit will have to wear the cameras for their entirety of their shifts. Detectives, plain clothes officers, and special units such as K-9 will have wear them when engaged in field operations or active enforcement actions. When will the cameras be turned on? From the policy: "Personnel shall activate their BWC without unnecessary delay upon being dispatched, in the case of self-initiated events prior to citizen engagement, and/or immediately upon observing circumstances supporting constitutional justification, when feasible." The policy details these events -- they include calls for service, emergency vehicle operation mode, pursuits, all enforcement actions such as arrests or any potential use of force situation, field sobriety tests, and prisoner transports. When will the cameras not be turned on? + Officers will have some discretion about whether to turn off the cameras if they go to a home to take a report for something like a car that had been struck and the person requests the cameras be turned off in the home. + Officers also have discretion about whether to activate the cameras during events like community policing functions or snow emergency details. Sears said Tuesday that officers that don't turn on the cameras -- or don't follow the policy in some other way -- will be subject to the department's regular disciplinary process. Acting APD chief Robert Sears. The goal is start deploying the cameras to officers July 1, Sears said. The department is planning to deploy 250 cameras in all. They'll be rolled out to 10 officers at a time. Sears said the department will make sure the cameras are working for those 10 officers, then it will move on to the next set of ten. If everything goes just as it should, Sears said the rollout could be week to week -- though he was reluctant to set an overall timeframe. "As we put more on top, there's the potential for more issues," he told the media after Tuesday's meeting. "So we really just have to do it slow and sure. When I was doing my research, I realized a lot of people around [the country] had problems with deployment." Sears said many officers had volunteered to be part of the pilot test of the cameras, which he took as a sign that officers are welcoming the tech. The body camera policy mandates that captured video be stored for 180 days. Sears said that length of time was chosen because it's the window that people have for filing a complaint with the Albany Citizens' Police Review Board. And that's one of the few situations in which access to the video will be shared. Sears said access to body camera video will be limited to: police and other law enforcement agencies, attorneys involved in criminal proceedings, and the CPRB when a complaint is made. The video will also theoretically be subject to the state's Freedom of Information Law, but in practice access to it via that avenue will be very limited (more on that below). During last year's public meetings, multiple attendees expressed a desire for there to be some sort of independent mechanism for reviewing body camera video. The thinking being that if the cameras are to serve an accountability function, there has to be someone outside the police department with the independent power to play that role. But that's not in the policy the APD has settled on because, as Sears said Tuesday, of a state civil service law known as 50-a -- interpretations of which have regarded the video as a personnel record, and thus not allowed to be released. "We can't do it. The rules and laws don't allow for it right now," Sears said after Tuesday's meeting. "We've done extensive research in that regard and everyone is pretty much saying that [the videos] are not subject to random release." And changing that would required action by the state legislature. 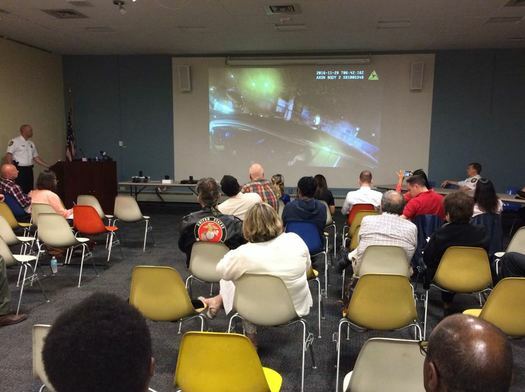 Tuesday's meeting included a presentation of a handful of videos recorded by Albany police officers during the pilot testing: two traffic stops, and one response to a complaint about loud music. They showed the promise of the cameras -- at times it felt like being in the place at that time, almost like a first-person video game. But they also showed some of limitations. The video is being shot by a camera clipped to someone's chest -- as the person moves, the cameras moves, it shakes, scenes without a lot light are grainy and hard to make out, sometimes the audio is muffled. "They're not going to show everything. I think we've seen in recent months and years that that when there's body-worn video, it doesn't show everything, you can't always hear stuff," Sears said. "When you're in groups of people or dealing with certain situations, it's only going to show a certain amount. The videos that we showed tonight are very neat and clean videos that we were able to see pretty much everything. I don't anticipate to be happening all the time with this video footage." One woman at Tuesday's meeting had a good question about whether the department had tested the various camera models in simulations meant to mimic some of the intense situations where the camera video could be of great interest -- in a chase, for example. Sears said the department had not, but he said afterward it was something to consider. Based on the questions and comments at last year's meetings and the one this week, it seems safe to say that many people want to see these cameras deployed sooner rather than later, and they're hoping the cameras will provide some insight into the contentious -- sometimes fatal -- situations that can arise between police and the public. Alice Green -- the executive director of the Center for Law and Justice in Albany -- was at Tuesday's meeting, and afterward she cautioned that people should temper their expectations about the effects the cameras will have. 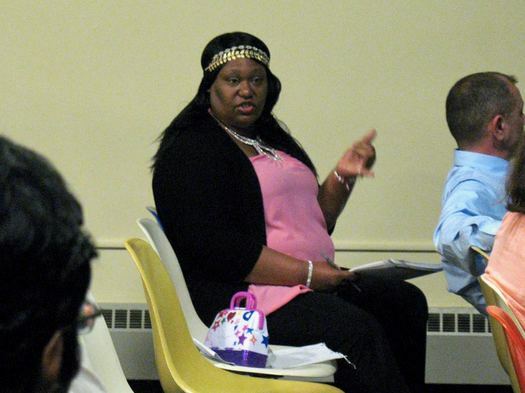 "The thing that we worry about is that the community might think that body cameras are a sort of panacea that are going to solve all the problems with the relationships between the community and the police -- and that's not going to happen," she said. "It's going to take a while for people to understand that we still have to rely on human beings, their attitudes, how they relate to people, their biases, their prejudices." Green emphasized that it police training will continue to be important, even with the cameras. "I believe in that personal relationship that has to develop, that police officers have to grow, have to understand the population they're policing." Sears said Tuesday he estimates that the body camera program will cost the department about $300,000 per year -- that includes the equipment and paying for the cloud storage of the video. The $133,000 from the feds -- which requires a city match -- will help get things started. But after that, the money will have to come from the regular city budget. He said he's hopeful about the program. "I think a lot of folks want them, a lot of folks think they'll help interactions. And, like I said, some of the officers want them as well. I think it's going to go well. I think it will help. How much, I don't know. But I think it will help." Would feel better if all politicians had to wear a camera....maybe truth could be found then!